Marketing is for everyone. Yes, you read that right. It does not matter whether you are a civil engineering student, or in the early childhood education program, it is important to recognize what you bring to the table when applying for jobs and internships. So often the idea of “selling/marketing yourself” comes with a negative, inauthentic connotation. I’m here today to bust that myth. WHAT DOES MARKETING YOURSELF MEAN? Marketing yourself is the idea of identifying your niche. As a college student, it is vital to identify why employers should want you over another applicant. Marketing yourself means identifying your interests. For example, if you are interested in the outdoors, perhaps this could lead to sustainability. It also means looking at what skills you have and which you can improve upon. You might consider making a list of skills and how you can apply them to the workplace. Some example skills would include: public speaking, time management, organization, or teamwork. Creating a personal brand means understanding your strengths, values and most importantly, what you uniquely bring to the table that other candidates may not have. For example, if you are a political science major with interests in sustainability and values of inclusiveness and empathy, you can find ways to build these into your brand. The Career and Internship Services Office offers three different assessments that can help in finding your strengths and personality, as well as interests. Once you have the content for your personal brand, put it to life in your LinkedIn profile, Resume, Cover Letter, social media platforms and your life as a whole. If you live out your values and what makes you unique, it will shine through in your job search process. This resume section, although unpaid, shows a passion for public speaking and an interest in promoting diversity. Crafting a cover letter is also a prime opportunity to market yourself. Take this opportunity to go above and beyond and showcase your personality. Try to find out the name of the person at the company that the letter should be addressed to. Describe your potential value to the employer. Do this in such a way that focuses on what sets you apart from other applicants. Maybe you were President of a college club that relates directly to the type of work you would be doing, or maybe growing up you always had a passion for the company you are applying at. These seemingly small concepts can help you go from an average job candidate to securing an interview. The first step to marketing yourself on LinkedIn is to make sure that your profile is fully completed. That means the summary, education, experience, profile photo, and all other areas are polished. After this is complete, go on to engage. Share and like posts that are a good representation of yourself. Always post online like the CEO of your company is going to see the post. You are finally done with your Fall semester and finals, hooray! It’s now time to relax, but do not forget to stay on top of things and use your time to stay productive. Spring semester will be here before you know it and you do not want to be behind! Take a little bit of time to think about the semester you just finished. Think about what you did and didn’t do well. Use that information to make some goals and identify priorities for yourself for the next semester. Reach out to people or companies you have been wanting to contact, but haven’t yet. Expand your horizons, you never know how it could develop your professional profile. This could be done online through email, LinkedIn, a phone call, or you could even ask if they would like to get coffee. Remember to thank them and ask if they have any suggestions of who else you could reach out to. Informational interviews and job shadows are a great way to see if the profession you are thinking about is the right one for you. Most students do not have time to conduct these during the semester, so now that you are not in classes, take advantage of this time. This could also help you with career advice or confirm important classes that you should plan on taking. Rack up the hours at your job, if it’s possible! Winter break is a great time to save up to keep you on budget for the spring semester. Many scholarships and internships are posted during this time, so start looking! It is better to start searching for these opportunities earlier rather than later, your chances will most likely be greater. If you need help with this, you can visit Career and Internship Services (we are open during winter break, except Dec 23rd-Jan 2nd). Whether you need volunteer hours or you just want to give back to your community, the holiday season is one of the best times to do this! Use your free time to put some smiles on the faces of your fellow city residents. Now that you finished another semester, you probably have new projects, jobs, skills, and experiences you can add to your portfolio, LinkedIn, and resume. Take the time to update all of these so they are ready for when you start searching for a job or internship, then you will not have to frantically put all of these together at the last minute. Hopefully, you will take advantage of this time when school is not crazy and do at least one of these suggestions. But do not forget to relax and enjoy your time off during the holidays, drink some hot chocolate, eat some cookies, and enjoy the twinkle lights with your family or friends. Happy Holidays! You might have heard or considered copying and pasting your resume content directly to your LinkedIn profile account. Though this isn’t wrong to do, here are some reasons why you should avoid it. Today’s post derives from an interesting article I came across, 7 Ways Your Resume and LinkedIn Profile Should Differ by Arnie Fertig. Though there are seven specific points in the article that he makes, I want to summarize and highlight the main key ideas. First off, a resume differs from a LinkedIn profile in the sense that it is a simplified document that highlights all of your key experiences. In addition to this, there are always limits as to how much one can include within a resume. A strong resume will be one or two full pages of content, excluding the references. Furthermore, the syntax and diction used in a resume are more formal and concise, and because of this the descriptions and details in a resume are more likely to be shorter. A resume contrasts from a LinkedIn profile in many different ways in terms of style and etiquette. In resumes, the style of the document is very formal, objective, and let’s be honest, bland. On the other hand, a LinkedIn profile is more personable, free-flowing, and flexible. Arnie makes a great point by making the distinction of how resumes are submitted to recruiters and companies to be considered, whereas your LinkedIn account is searchable and can be looked by anyone at any given time. As mentioned from the previous sections, the content between the two differ in various ways like style and limitations. The content of the resume is much more formal and thus is a bit more restricted in what can or cannot be said. In a resume, the objective is to describe the key tasks and points of your experiences in a concise manner. Whereas on LinkedIn, you can be more subjective and talk about your experiences from your own personal voice. The content information that you can include in a LinkedIn account is remarkable compared to a resume. Overall, you can do SO much more on LinkedIn. LinkedIn allows you to add media content such as presentations, web links, pictures, etc. to your list of experiences. There aren’t any life lessons to be learned in today’s post, but if there’s one thing I would like to push for, it’s to explore LinkedIn! When time permits, venture and explore the wastelands of LinkedIn and see what’s out there. You never know, you might find gold sitting around just waiting to be discovered. All credits of the title “Distant Worlds” goes to the rightful owner of the Final Fantasy music company. No copyright infringement intended. LinkedIn has all sorts of hidden tools that you may not know about. Today I will be talking about the “Find Alumni” feature. You can find this under the “Connections” drop down menu at the top. This provides you with all the information you might want to know about your fellow alums. You can get information on where they work, what they do, and where they live. LinkedIn automatically fills in the years in which you attended school, and shows you classmates who attended your school, or who are currently going to that school. For a broader search, you can adjust the graduation years at the top. When you first click on the “Find Alumni” link it will show you a list of places where your connections/alumni live, where they work, and what they do. If you look below that list there will be a link that says “Show More,” this will list even more potential places people live, where they work, and what they do. BUT WAIT, it gets better. 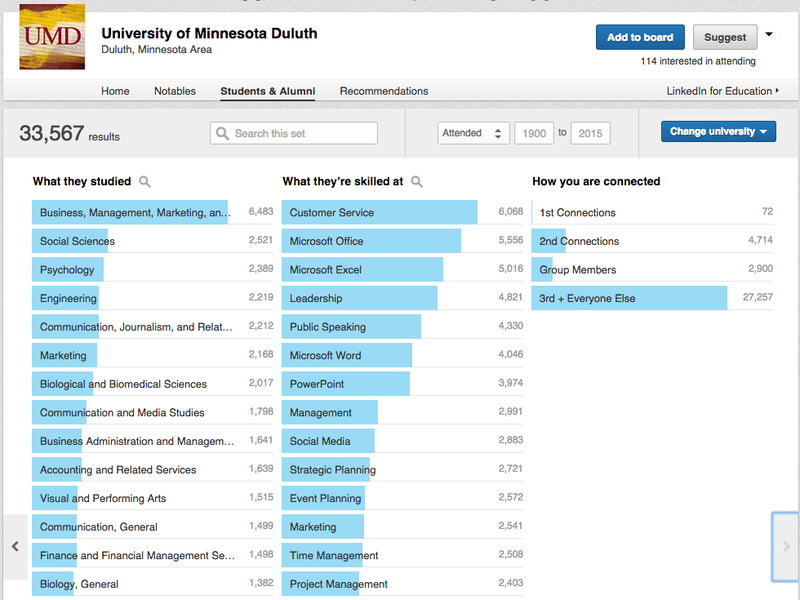 If you click on the arrow located by the section of “What they do” it will show you what your connections/alums studied in school, what skills they have, and how they are connected to you. 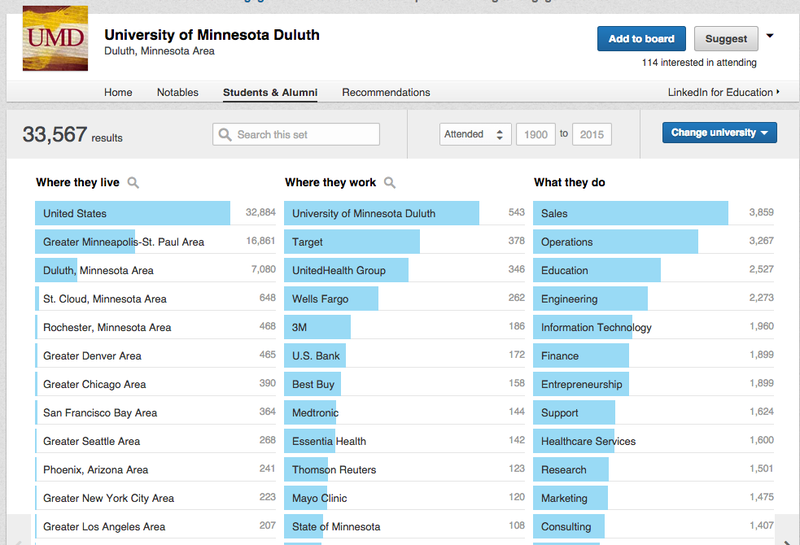 If you’re trying to determine a major the “Find Alumni” feature can be very beneficial. If you’re unsure about what you can do with your major, say for example you’re majoring in Psychology, but maybe you’re thinking about Education as well, you can specifically click on “Psychology” and “Education” and it will list people with those academic backgrounds and you can look into what those people are doing for occupations. 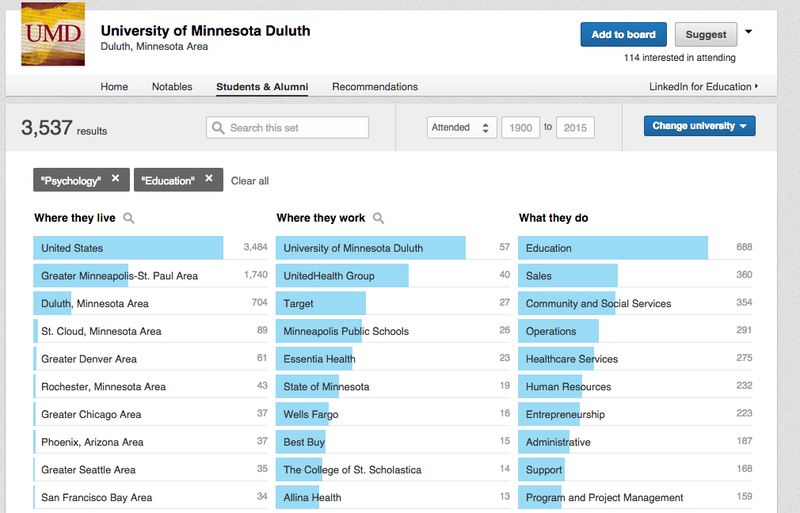 The “Find Alumni” feature can also help you with searching for a career. For example, if you’re a nurse and you’re interested in working at Essentia Health you can find it under “Where they work” or search it in the search bar, and find who’s currently working there, then you can make connections based off of that. If you don’t see a business or organization that isn’t listed, you can always search for it. If you click on “Notables” at the top, you can find notable connections/alumni in your area. 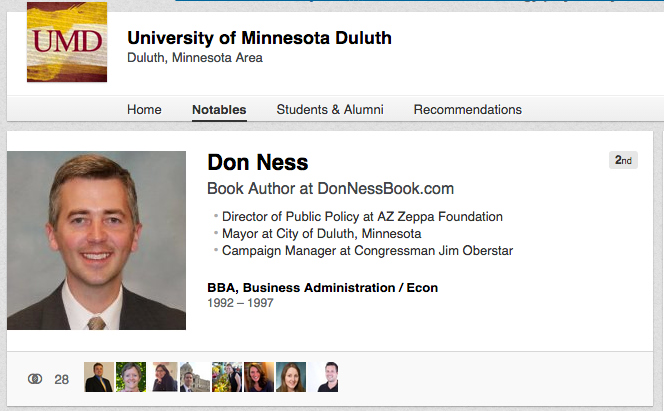 For example, Don Ness, the mayor of the city of Duluth. And lastly, while you’re searching under “Students & Alumni” you can change the university you’re looking at, so that if you’re interested in transferring schools (which I don’t know why you would even do that because UMD is the best school ever) you can find out information about that specific campus. Often when people think of networking they picture an evening event with 200 or so students and professionals mingling in business attire while balancing plates of intriguing looking hors d’oeuvres. This is one approach, and there are a variety of options for students to expand their network, learn about interests, and seek out new experiences. We are here to help you prepare for large scale and smaller scale networking opportunities! Here are just some networking suggestions, and you are encouraged to find ways to network that make you feel comfortable and boost your confidence. Attend a speaker presentation or information session on campus. Introduce yourself to the people seated around you. Introduce yourself to the speaker afterwards and ask a relevant question. Get to know your classmates. Fellow students may hear of opportunities that are not a fit for them, and they are more than happy to share the information. Do the same for others when you hear of opportunities. Take advantage of professors’ office hours. This is a time to get to know professors outside of the classroom. Professors may be more inclined to write letters of recommendation for you down the road if they know you outside of the classroom. Build an effective LinkedIn profile. LinkedIn Drop-In hours (every Thursday, 2-4pm, in SCC 22) are available for assistance in developing a LinkedIn presence. Create a positive, consistent social media presence across several platforms. Complete informational interviews. Students repeatedly report that these are helpful. Informational interviews allow a student to sit down with a professional in a field of interest and learn more about the career path prior to seeking out internships or jobs. Attend job & internship fairs early. 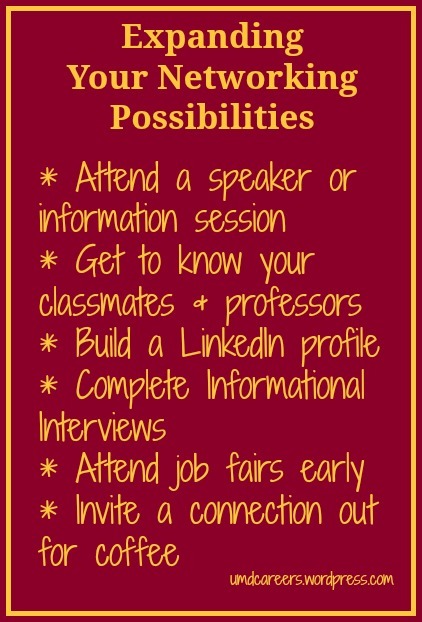 Attending job & internship fairs as a freshman or sophomore has advantages. Employers remember students who express interest in a company multiple times. Invite a connection or potential connection out for coffee. Learn about their career path and share your career interests. This can be a casual yet still professional way to develop connections. Networking is more genuine and productive if it takes place before the individual actually needs something. Words of advice: start early! This discussion started from a question I heard asked, “Why did someone less qualified land the job I applied for?” This is a tough question that most of us will probably ask at some point in our lives. Before answering, I want to get something out there: It is nearly impossible to land every job that you apply for. To not have an offer extended to you for a job you tried hard to get is not the end of the world. Keep your chin up, and use the opportunity to learn! Since nobody is perfect, it is always important to try and understand what you can do better to land the next job you apply for. There could be many reasons for not landing a job, but out of the many things that people can do to improve, there is only one fact I want to talk about today. There is a saying that you may have heard at one time or another: It is not what you know, it’s who you know. Often, employees are hired because they have had experience with the employer, or with the people making the hire. In fact, a large portion of people still say networking is how they landed their job. If there is a networking event that you think an employer you are interested in working for is attending, go attend that event. Have a nice conversation with the employer. Find more employers and have nice conversations with them as well. If you leave the networking event having got to know 3-4 employers, you are doing really well! You never know when an opportunity will open with those employers, even if you are not looking there just yet. If you end up wishing to apply for a position in one of these companies, contact the people you connected with on LinkedIn and ask about the position. There are other things you can do to build your network, like talking to friends of friends, but the instructions above focus on opportunities that are open to quite a number of people, especially college students and recent graduates. Always stay on the lookout, or the opportunities may just pass by you!